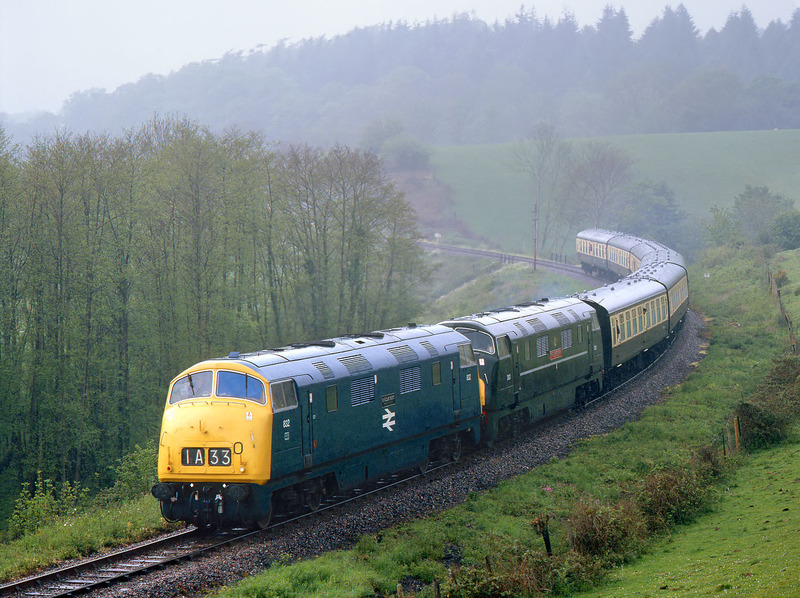 In the pouring rain, the only two surviving Class 42 'Warships' 832 Onslaught & D821 Greyhound round the curve at Roebuck Farm on the West Somerset Railway with the 1V55 14:50 Minehead to Bishops Lydeard service on 17 May 1997, during the line's Diesel Gala. As the lead loco is in blue livery it is correctly showing the number 832, minus the D prefix. I suppose you would call this picture atmospheric, but standing in the field during a downpour was not what I had in mind. If this picture appears to be suffering from excessive film grain, believe me it isn't - that it what it looks like when taking pictures in a monsoon! Not much change of seeing the film grain on a 6x7 slide anyway.